Standard model with output power 7 watts at fiber end, pulse or CW, air cooled with silent cooler. Wavelength 810nm. Both DenLase models have same functions and vary only in wavelength. 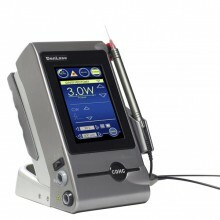 Click the button below to add the DenLase 980 Dental Diode Laser 7 Watts to your wish list.